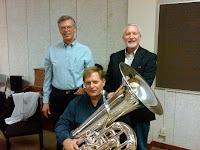 My recent brass displays and tuba trips have been a huge success and a wonderful opportunity to connect with old friends. I had lunch with Don Little and Alex Cauthen in Denton. We haven’t been all together since our studies with Arnold Jacobs in grad school at Northwestern in 1971. It was also nice to see Vern and Jan Kagarice at UNT. Vern was very complimentary about the Dual-Use trombone and its potential. The enthusiasm for the J-700 BBb has been unanimously enthusiastic. Reaction to the J-880 CC tuba has been mixed. Everyone loves the way it plays. Not everyone loves the ergonomics but those that do are adamant that it should stay as is. 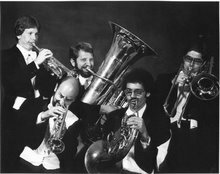 Those players put the tuba on a stand in a very upright position. They really like the right hand position; no bends, no stress. The players that do not like the ergonomics of the J-880 will be pleased to know we will add another model, the J-870 with the mouthpipe positioned like the J-700 BBb tuba. This model will have an 18” bell and brass slide tubes like the J-700. Pictures of showings at Rice University with Dave Kirk and Mark Barton as well as at UTA with Edward Jones and UNT are posted at the right.